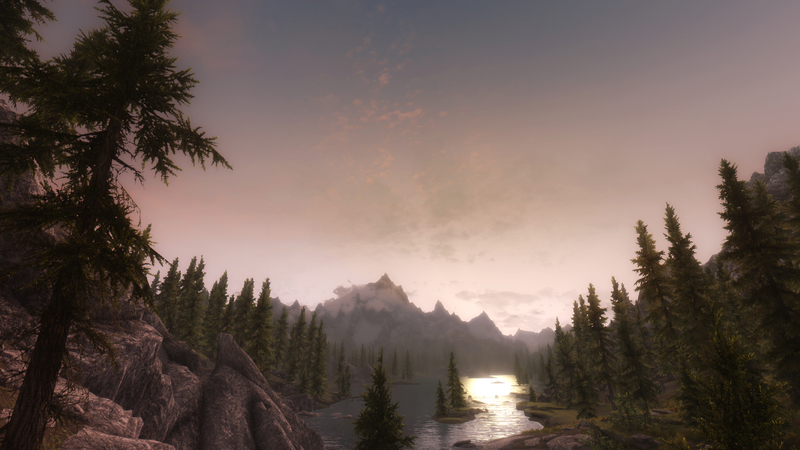 'ENB' is short for 'ENBSeries', which is a post-processing 'engine' with versions available for many games, including Skyrim. This Guide will help newcomers become familiar with the basics of installing and using ENBSeries and will also provide answers to many questions applicable to all users from those wishing to quickly install and configure ENBoost or a full-blown ENB preset, as well as, advanced users and ENB preset developers wanting to reference more of the technical information. The main guide is written to address novice and advanced users alike with 'quickstart' in mind. Links to more information and ancillary guides are included. ENBSeries (ENB) is a post-processor modification (mod) created and maintained by Boris Voronstov. What this means is that ENBSeries adds digital enhancements to games purely by modifying the video output after (or 'post') the decoding process of game assets into the initial graphical result. Initial post-processing is done by the game's shader program(s), and ENBSeries builds upon this initial post-processing using more advanced techniques that the game's shader engine is either incapable of or simply doesn't implement itself. This is accomplished by using a custom API in the form of a dynamic link library (DLL) to the game shader engine. In addition to advanced shader post-processing, ENBSeries also implements a memory manager, called 'ENBoost', that enhances the efficiency of video memory management, resulting in increased performance and stabilization, in addition to the increased quality provided by the post-processing engine. If that was too technical, ENBSeries (ENB) is a mod that allows authors to make custom presets (commonly referred to as "ENBs") which change some effects, like lighting, and enhances or replaces others, like shadows and the sun. Each preset can offer a range of "look and feel" environments for the game it's used for. Such as providing a cooler or warmer color palette, fantasy or "realistic" lighting environments, and/or either more vibrant or bleak saturation. The combinations are endless and there is likely an ENB preset that is perfect for every user's personal tastes. However, all those added effects often come at a cost to performance. Luckily, most authors provide "performance" versions of their presets which are lighter on resources. ENBoost is a memory management feature added to ENBSeries to address the crashes and freezes relating to the well-known system memory (RAM) limit of 32-bit applications like Skyrim. It is one major part of a multi-part solution STEP recommends for dealing with this limitation (see 2.C. Extenders section of the STEP Guide). ENBoost is included in the ENBSeries graphics modification and is now incorporated into all ENB presets using ENBSeries v0.192 and newer. ENBoost can also be implemented as a stand-alone video-graphics memory manager for Skyrim without implementing any ENB post-processing effects. using system RAM outside of TESV.exe for dynamically allocated cached data. The second method is accomplished by running an executable named enbhost.exe, which adds up to another 4GB of memory available for ENBSeries to manage per instance. The effectiveness and performance of ENBoost is determined by a number of factors, such as size of system RAM / VRAM, quality of video card, version of Windows OS, CPU, and even motherboard memory channel speed. Fortunately, a number of ENBoost user-settings have been added to account for the enormous variety of user's system configurations. Notice:ENBoost is not ENB per se. Rather, ENBoost stand-alone configuration implements only the memory-management features of ENB without the lighting enahncemets that most people associate with ENB. Thus, ENBoost is an essential extension that STEP recommends for ALL users, even those that are not running ENB 'proper'. As described in the Introduction above, an ENB Preset (aka 'ENB') encompasses all of the features of ENBSeries, including ENBoost and all the post-processing features. The latest versions of ENBSeries available to download include many enhanced and new features verses older versions. Most ENB Presets which are still in active development have been updated to utilize one of the newer versions, or have stated that they are compatible with them. Any ENB Preset which uses a version prior to v0.236 is outdated and could possibly have issues when attempting to use them with the latest ENBSeries versions. The Preset recommendations below are current for at least one of the latest ENBSeries versions. So, what's new? This is a basic quickstart and generic set of instructions for setting up ENBSeries; however, most ENB Presets include installers or detailed installation instructions of their own. The following instructions provide assistance where certain ENB Preset instructions may be lacking. Always defer to the Preset instructions first, and use the following instructions to fill in the blanks, if necessary. Download the latest ENB binary. The links at the bottom of the page list all the binaries. Choose the latest file (usually the one at the top of the list), then on the next page click the button located at the bottom of the page. Select and download a preset from Nexus (or see some of our suggested Presets below). If needed for the chosen Preset, download the ENB Helper, and extract enbhelper.dll into .../skyrim/enbseries/, creating the directory if necessary. Notice:The helper file is required by ENB v0.250+ for per-weather support and is usually provided with the preset if the preset requires it. Extract d3d9.dll and enbhost.exe from the "WrapperVersion" folder inside the ENB archive (image) into .../skyrim/. Be sure not to extract it into the data directory. Alternatively: If the "WrapperVersion" does not function as advertized, try the "InjectorVersion". Remove any existing remnants of the Wrapper version, and extract only enbhost.exe, ENBInjector.exe, enbinjector.ini, enblocal.ini, and enbseries.dll files from the "InjectorVersion" folder into .../skyrim/. Notice:If running the injector version, the ENBInjector.exe must be running in the background before starting the game or ENBSeries will not work. Likewise, extract the content of the ENB Preset's archive into .../skyrim/. for a very good video tutorial on basic ENB Installation. Since the introduction of ENBSeries for Skyrim, there have been hundreds of ENB Presets created; however, most have not been updated to use the latest version of ENBSeries; therefore, please refer to the chosen ENB Preset's documentation to ensure the correct version of ENBSeries is downloaded and used. ENB Presets come in just about every style imaginable. As such, this section can be extremely subjective. STEP suggests browsing around to find the perfect preset to suit the user's personal preferences. There isn't an official STEP recommended ENB Preset, however, below are a few excellent, widely-used Presets and information about them. For general installation instructions, see the Installation section above; however, it is highly recommended to follow the author's installation instructions found on the ENB Preset's Nexus page. Vividian currently supports ENBSeries v0.305+. Vividian is a two part Preset; an ENB and a mod. The ENB adds a more vivid character to Skyrim without completely removing the dense atmosphere from the vanilla game. Depending on the version chosen it provides either more vibrant colors and effects or simply enhances the vanilla colors. Both versions also grant more realistic shadows and weather. 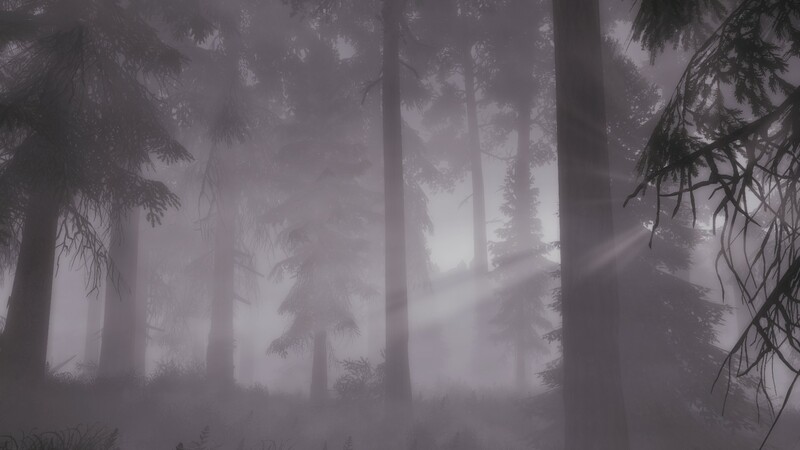 Clouds, fogs, smoke, and steam textures which replace the vanilla versions and are designed to work well with ENB features. Windy Clouds which enhances the cloud speeds of weathers so the clouds actually look as if they're moving and not standing still in the sky. Extended Groundfogs which adds distant clouds and fogs to all weathers, as well as, volumetric fog to foggy weathers. Real Skyrim Snowflakes adds a snow effect around the player which uses real particles for the snow; replacing the fake snow from vanilla. This new snow is also lit realistically by lights in the game. 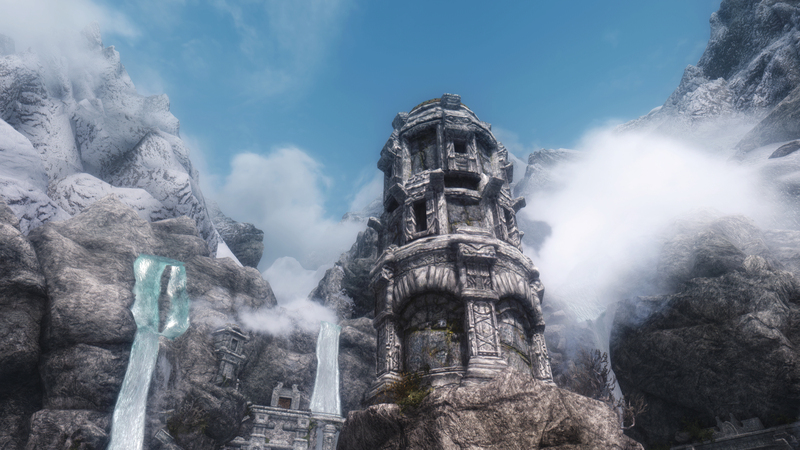 Vividian is one of the most compatible ENB Presets available and is currently compatible with vanilla Skyrim and the DLCs, Climates of Tamriel, Pure Weather, Purity, RCRN, ELFX, ELE, Relighting Skyrim, NLA, Extended Snow System, Real Shelter, and Falskaar. The "Vivid" version has more saturation and vivid colors compared to vanilla Skyrim. The "Vanilla" version maintains vanilla Skyrim colors and saturation; simply enhancing them by making them deeper and richer. Vividian has three performance versions available. Performance: is a version which has had some effects lightened or completely turned off. This version is recommended for less powerful systems. Normal: is the main version which most users will be using. This version has all the effects enabled, yet is balanced between performance and quality. High Quality - is the extreme version. Use this with caution! It will be crippling on all but the most powerful systems. Phinix Natural ENB currently supports ENBSeries v0.308. Phinix Natural is an ENB Preset for Skyrim purist. The atmosphere and environment of the vanilla game is one that is Nordic which is cold and wintery. Phinix Natural emphasizes on being natural to the vanilla atmosphere and; thus, provides an enhanced cold and wintery feel. Colors will not be overly saturated; however, will have more depth. The sky is slightly washed out as you would see in colder regions and the sun gives off more glare. Phinix Natural can also be described as being a subtle ENB Preset simply because it enhances the vanilla atmosphere. It is one of the few ENB Presets that can be installed and forgotten that an ENB is even running due to its subtlety. Nights and interiors are more or less the same levels as vanilla; however, dungeons are just slightly darker. If you're looking for the true Skyrim experience as Bethesda meant it to be, then this ENB might be for you! Phinix Natural is compatible with all lighting mods; however, the author recommends Relighting Skyrim. The author has also customized all vanilla weathers for those who choose not to run Climates of Tamriel. CoT is full supported, though, with all CoT weathers customized so it is also recommended. Although Phinix Natural does not come with different performance options, the author does discuss how to lessen the performance impact on his Nexus page. OrganicENB V2 currently supports ENBSeries v0.315+. OrganicENB V2 is a Preset that bridges the gap between realism and fantasy. It provides rich, vibrant colors without going over the top. Vanilla Weather: is for users who do not use any weather mods. Climates of Tamriel: is for users who prefer CoT as their weather mod of choice. Vivid Weather: is provided for users who prefer Vivid Weather. Skysan is the highest quality with all the bells and whistles, but is also the most performance demanding. Midrange disables ambient occulusion (SSAO) and the exterior reflections. Budget disables skylighting, water, volumetric rays, and mist in addition to ambient occulusion (SSAO) and exterior reflections. The above mentioned ENB Presets are a very small sample of the presets available on Nexus. They are both popular and up-to-date; however, users are encouraged to explore other options to find the ENB preset that fits their style. Users can search Nexus and browse through the 300+ ENB Presets available. Below are a few mods which normally work well when combined with ENB Presets; however, be sure to view the chosen ENB Preset's documentation for mod compatibility before using any of the mods below. 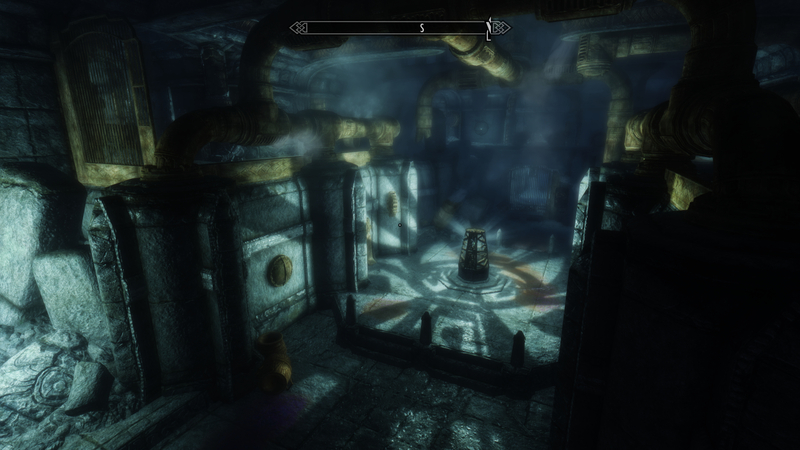 Dark Dungeons for ENB - This mod tells ENB to render dungeons as though it's night. 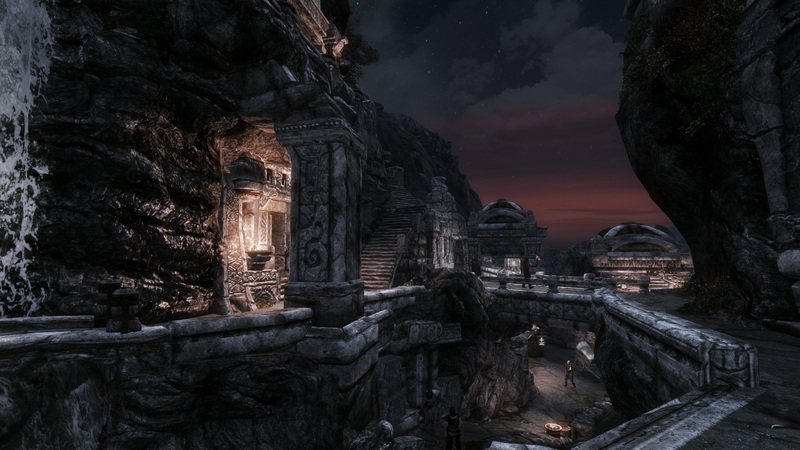 Many ENBs include optional files for darker caves, dungeons, and nights. Check with the ENB Preset for these options before using a third party mod for this. Some lighting mods may not be compatible. Skyrim Particle Patch for ENB - This fixes shaders or blending properties on some object meshes which have their parameters set incorrectly. Some ENB Presets include this patch during installation or provide it in as an optional file. Remove Interior Fog V2 - This removes the ambient interior fog that is found indoors in many locations. It has support of all DLCs. Interior and Dungeon Fog Remover - Completely removes fog meshes from most dungeon and indoor locations. This mod is compatible with Removed Interior Fog V2 above, the two can be used together. Revamped Exterior Fog - This reduces the density of exterior fog and increases the distance that it starts becoming opaque. If using RCRN, there is a compatibility version which should be used instead. Some mods that are often combined with ENBs are not compatible with the mods mentioned here (i.e. Climates of Tamriel, Realistic Colors and Real Nights, etc). As good modding practice, please review the Readme of any mod being used. ENB FXAA SweetFX Manager and Remover - Removes ENB and FXAA installations and provides slots to load different ENB configurations for quick and painless switching. IMAGINATOR - Visual Control Device for Skyrim - In-game tool that allows adjustment of color and lighting setting such as brightness, tint, contrast, saturation, etc. For many users this has been a useful way to adjust adjusting colors and lighting in-game with or without ENB. DYNAVISION - Dynamic Depth of Field - adds a controllable dynamic Depth of Field and Auto-Focus to Skyrim. IMAGINATOR has largely been replaced by the ENBSeries GUI Editor now included in all ENBSeries versions. DYNAVISION has largely been replaced by custom DoF provided by Preset authors. The following components and tweaks are optional and NOT required for a successful ENB implementation. For ENB users, any version of ENBSeries after v0.119, hardware AA is no longer supported. Therefor, ENB users only have the following options available to them; ENB EdgeAA, SMAA or SweetFX using an injector. For users on low-end systems, the ENB's EdgeAA is probably the best choice because it comes with almost no performance loss. SubPixel Morphological Anti-Aliasing (SMAA) is a fantastic post-processing anti-aliasing method. SMAA is processed after the ENBSeries process which provides nearly equal quality of MSAA, at a faction of the performance hit. Users can also use SMAA injector with EdgeAA enabled to possibly gain an even better image quality. For users on mid to high-end machines, SMAA will be the best option. It's also worth noting that SMAA injector can be used without ENB as a standalone replacement for the game's or driver's AA method. If SMAA is not supplied by the ENB preset, users can download it from here. In the d3d9 folder (do not use the files from the d9d10 folder!!!) rename d3d9.dll to d3d9_smaa.dll. Non-ENB users do not need to rename this file. The available quality presets are listed above the parameter. The standard presets are: Low is 60% quality, Medium is 80%, High is 95%, and Ultra is 99% quality. This is similar to 2xAA, 4xAA, etc and each step higher comes with more of a performance loss. Additionally, a custom preset can be created in the SMAA.h file as seen in the image below for the Uber preset; however, this is a very advanced process, as such, it is not recommend for most users and will not be discussed here. For users wanting to learn more about SMAA, there is a very in-depth and technical PDF available here. 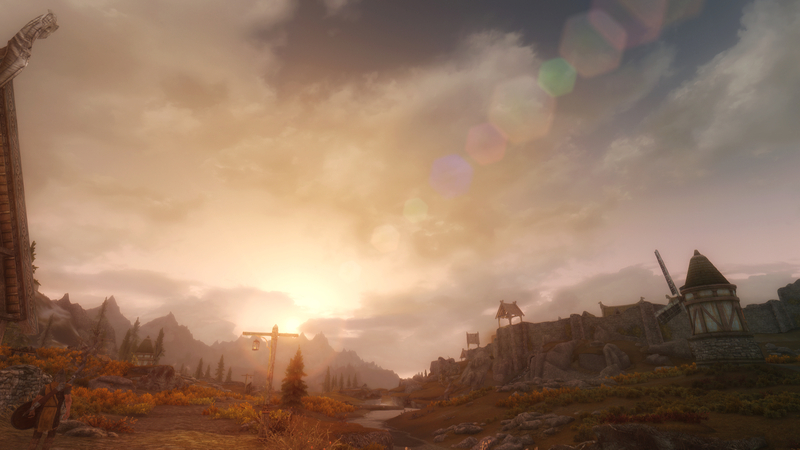 Enhanced Lighting for ENB (ELE) is a set of mods, by the author JawZ, aimed toward balancing the lighting of Skyrim. It adjusts every type of lighting in the game to both make Skyrim look better with ENBSeries and to make it easier for preset authors to customize and balance their presets without having to sacrifice one area of lighting over another. There are currently six modules to ELE, each of which balances a separate area of lighting in the game. These are Exterior Lighting and Weathers, Interior Lighting, Light Bulbs, FX Effects, Spell and Torch Lighting, and Plugins. These modules are still a work in progress; however, of these modules, Interior Lighting is the most complete and the most used most by ENB preset authors to date. Each of these modules are discussed further below. 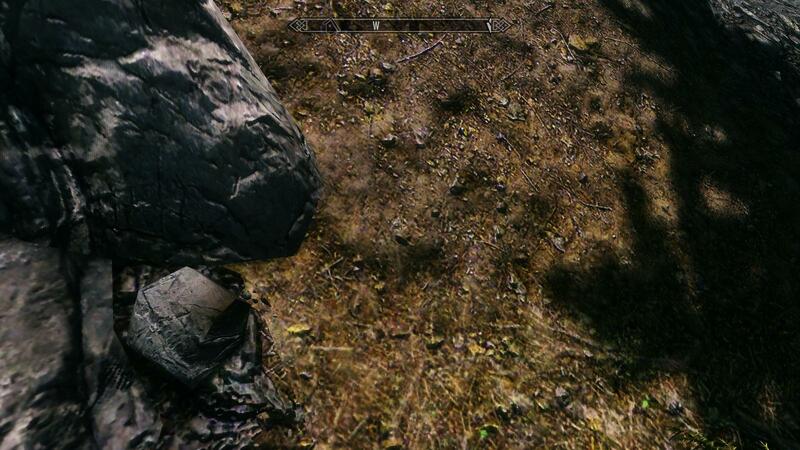 ... there is also an ENB Preset created by JawZ which uses a lightweight ELE setup. This ENB Preset was created as a modder's resource; however, can be used as a standalone preset. It is very lightweight on performance, provides vanilla-like colors, and also provides the basic enhancements of ENBseries such as improved shadows. Modders can use it to enhance/fix some vanilla issues. Authors can use it to create their own ENB Presets. Simply installing the ELE modules (described below) will not usually result in an outcome that looks great with the chosen ENB Preset. Presets must be designed to work with ELE or the results from installing it might not be desirable. Most often, if an author does design their preset around ELE, it will be the Interior Lighting module because it's the most complete of all the modules and provides authors better control over interior spaces than without it. Installing ELE is as simple as installing any other mod. Simply download the desired module(s), and install them using a mod manager like Mod Organizer. Load order is very important when ELE is combined with other lighting mods. The author has kindly provided several load-order examples designed around various setups that should provide a point of reference for most users. He has also provided a list of popular lighting mods that are and aren't compatible with the individual modules. This list is not only helpful for modders, but to preset authors as well. Authors can use the compatibility list when determining which lighting overhauls to support with their presets, if they choose to also use any of the ELE modules. In this module, weathers have been given more natural colors and they will no longer be dependent on imagespaces. Weathers also have been given better night/day detection during the daytime, nighttime, sunrise, and sunset. Sunlight has been balanced throughout all weathers as well and shadows have been edited to better enhance the visual appearance of the SkyLighting effect. Sky banding has also been reduced significantly with this module. Some visual bugs such as dark horizons during certain weathers have been fixed. Finally, a new sun texture is included to go along with the weather changes. It enhances the Sun Rays feature, has no grain/noise, zero banding, and will not overexpose most of the sky as the vanilla sun texture does. This is the default version of ELE and has the Interior Lighting module combined with these other modules: ELE - Spell and Torch Lighting, ELE Plugin - RS Light Color, and ELE Plugin - FX Emittance. For more information on these individual modules, see below. The Interior Lighting module covers changes in the imagespaces and LightingTemplates which have been balanced for more natural occurring colors. The imagespaces and LightingTemplates have also been named based on what type of interior cell they affect. This has been done for preset authors so they can simply edit a particular interior cell type without affecting anything else. Interior shadows have also been edited so they are properly lit and placed based on the exterior light that shines in from cracks in the walls or based on the amount of windows in the interior cell. Interior DirectLighting has been tweaked to be better used as an indirect lighting which the author believes serves as a good character lighting; therefore, the direction and color of DirectLighting have both been tweaked towards that end. The visual "bug" with dungeons looking bright as daylight as also been corrected. Finally, all of the interior classed cells have been fixed so they look more natural based on location. 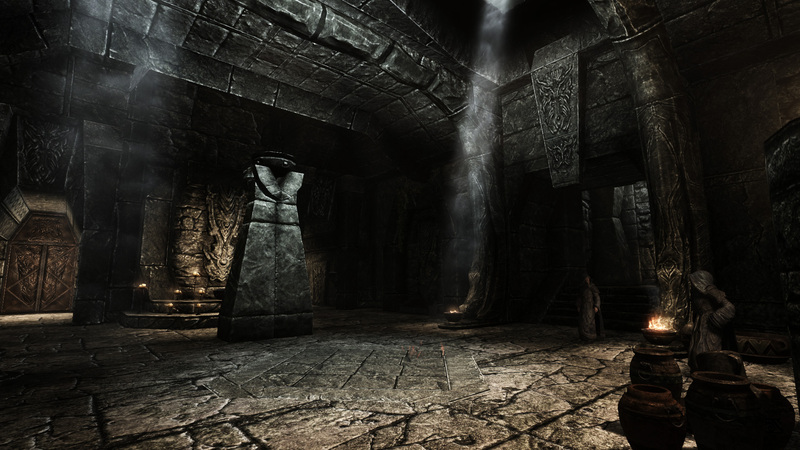 For example, the Temple of Kynareth is a "bright" classed interior while the Dragonsreach Basement is a "dark" classed interior; therefore, the lighting will now match the interior class. The Light Bulbs module covers light bulbs for both interiors and exteriors. Light Bulbs are the light that emit from fireplaces, candles and chandeliers among other things. Light Bulb placement has been corrected and new new coloring assigned to them based on "real life" sources. The Light Bulbs have also been named based on what type of light source they are placed at so preset authors can edit a particular Light Bulb type without affecting any of the other Light Bulb types. The FX Effects module handles all FX changes introduced by the ELE suite. It makes changes to the "windows dynamic changes" so ENBSeries, itself, can have full control of those changes. This module will also adjust the placement of FX effects, as well as, add or remove some FX effects based on the authors judgement. Spell and Torch Lighting module changes the color, radius and intensities of all the spell Light Bulbs while doing the same for the Torch light as well. As with the other modules this one edits the lighting to have a more natural color and specifically alters the spell lighting to fit the different types of spells more accurately. 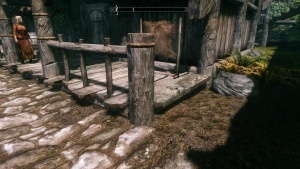 This plugin was created for Relighting Skyrim and is, thus, fully compatible with it; however, it is also compatible with any other lighting mods that doesn't alter the ParentLight Bulb found in the Object window in the Creation Kit. It makes changes to the ParentLight Bulbs by altering the colors so they emit a more natural color based on their placement in Skyrim. For example, all light bulbs placed at fire type light sources will give off a natural "fire light". This plugin was created for Falskaar. It alters some interior cell menu values to allow the ELE - Interior Lighting module to take full control of the Falskaar interior cells. 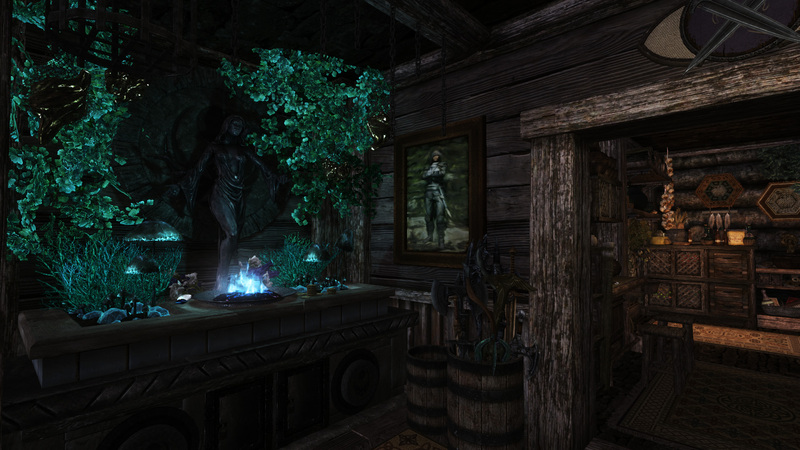 This plugin is necessary for Falskaar users who want ELE - Interior Lighting to have any affect in the Falskaar interiors. 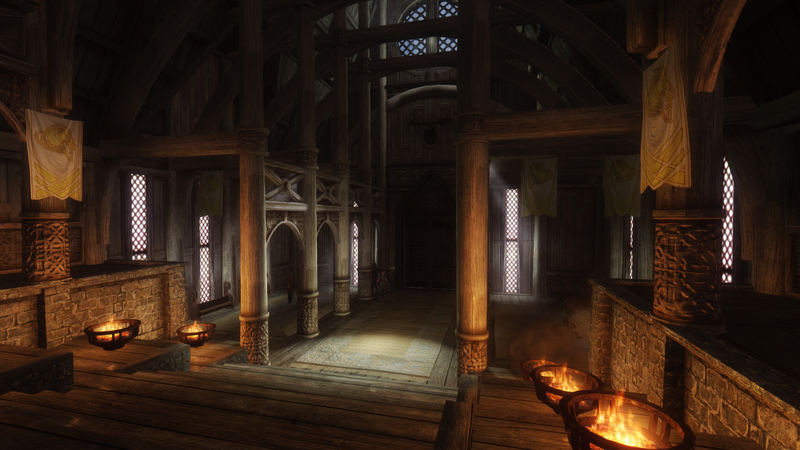 Due to changes the Falskaar mod makes, without this plugin Falskaar interiors will have the vanilla lighting. 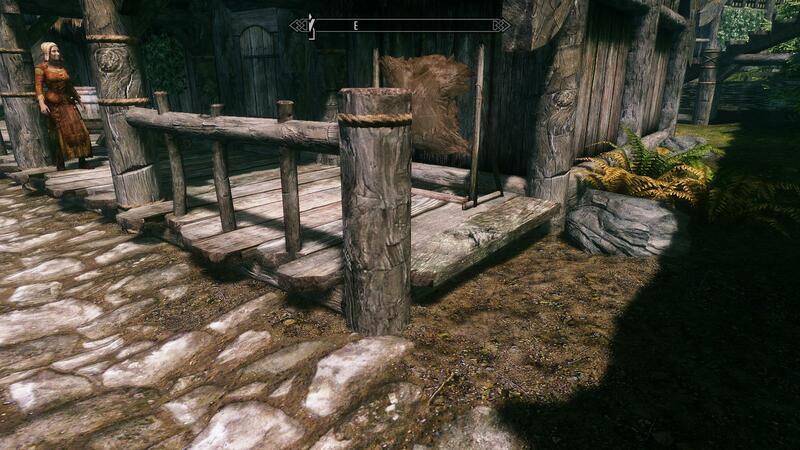 In vanilla Skyrim and the Relighting Skyrim mod, the sun-lit Light Bulbs in the interiors uses an effect called Exterior Emittance to make the Light Bulbs change their color based on the time of the day such as during sunset and sunrise. In vanilla, these colors are plain white and grey mainly. This plugin changes those colors more to more natural colors for a more realistic feel. The ENB configuration files (enblocal.ini and enbseries.ini) contain all of the user-configurable parameters required for customizing ENBSeries and/or Presets. There is a helper library (enbhelper.dll) that allows edits to parameters for each specific weather in Skyrim. The helper is essentially an API that queries current weather information from Skyrim and applies variants of enbseries.ini parameters using external configuration INIs. These external configuration INIs will override conflicting parameters within the main enbseries.ini file for specific weathers. This allows configuration of various parameters to differ depending on the weather type, thus creating more customized weathers. These variations can be very complex (one config per unique Skyrim weather) or very general (one configuration for only a small number of specific weather classes). 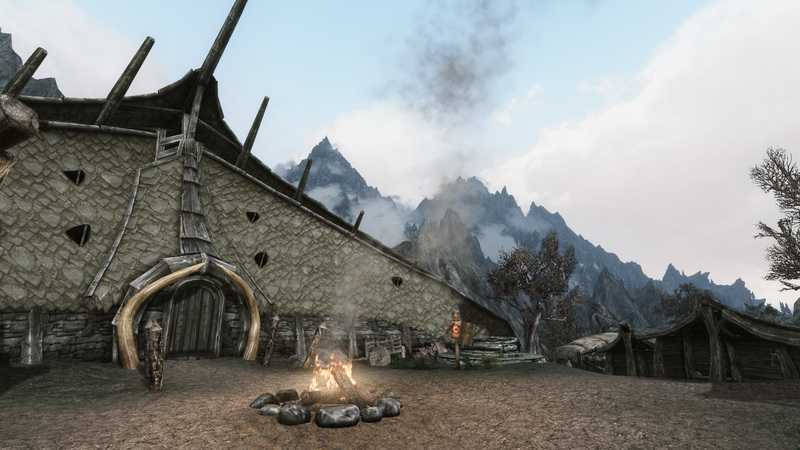 The helper library and all weather configurations are placed within .../skyrim/enbseries. Most ENB Presets that are configured to work with multiple Skyrim weathers package the "helper" with installation instructions by default. For those that do not, see the ENB Installation section above for assistance. Enables/disables use of the "helper" library and configurations to provide customized weathers. Notice:Configuring an ENB Preset that does not support variation per weather is currently not covered by this Guide. This would be a great addition if anyone would like to provide some basic information. While ENB Presets greatly enhance the visuals of Skyrim, these additional effects also take a toll on performance. How much of an FPS decrease users experience depends on their system hardware, INI settings, texture mod resolutions, display resolution, and a host of other variables. This is why it's virtually impossible to estimate how much any ENB Preset will affect a user's personal system. That being said, there are some things users can do to improve their performance. Defrag the hard drives which games are installed on. Do not defrag solid state drives (SSDs)! These should NEVER be defragmented and doing so could reduce their lifespan. However, defragging hard disk drives (HDDs) will not only help improve performance while gaming, but can also decrease load times in games and for other applications as well. Although Windows comes with a simple defragging program, STEP recommends either Auslogics Disk Defrag or Puran Defrag Free Edition. If using Auslogics, use the "Defrag & Optimize" option since this will also move the most frequently accessed files closer to the front of the drive. Defrag hard drives at least once a month or any time the fragmentation is 10% or over. If user's CPUs are being utilized 100% or system RAM is being close to filled, disable all unnecessary programs running in the background while gaming to free up more resources. Anti-virus programs disk access usage can cause slowdowns in saving and loading, and any files scanned. Instead of turning it off, setting it to ignore game directories and any mod directories used will prevent the antivirus from occupying the files in use. It also limits your viral exposure to a trusted folder (trusted if it came from legitimate sources). Some anti-virus programs now have a "gaming mode" which can be turned on during gaming sessions to automatically reduce the program's resource use on the system. Keep Steam in offline mode. This is just one more thing depleting resources that really isn't needed. GPU settings play a tremendous role in determining quality and performance. Striking the right balance in these settings is essential in achieving a beautiful game with smooth, playable frame rates. Use the guides provided in the STEP guide as a starting point. Adjust and test the settings until the right balance, with smooth game-play, is achieved. The thing to remember here is to be realistic with what the hardware is capable of. Be realistic with INI settings, as well. Over-tweaking can, and will, cause performance issues if the system is not capable of handling the additional strain. Use the STEP recommended tweaks and nothing else until it's known whether the system can handle higher settings or not. High resolution textures and higher polygon count meshes also affect performance. There are countless mods which add these higher resolution assets to the game. Careful consideration should be used when adding these assets with an ENB Preset enabled. Experimentation and testing might be required to find the right balance of quality and performance which best fits the system hardware capabilities. Be realistic with screen resolutions. Users are not going to be able to play Skyrim in 4K resolution with a single GTX770/AMD 7870. The maximum resolution of the video card is not the maximum resulotion it is capable of playing a heavily modded game with an intensive ENB Preset running. Users may have to lower their screen resolution if they want the full quality that presets provide. Again, it's all about balancing visual quality with performance and this will be different for every user. Some of the more intensive ENB effects can also be disabled or lowered in the enbseries.ini file to improve performance at the cost of some quality. Instructions on how to disable these effects can be found in the INI sub-sections of this Guide. 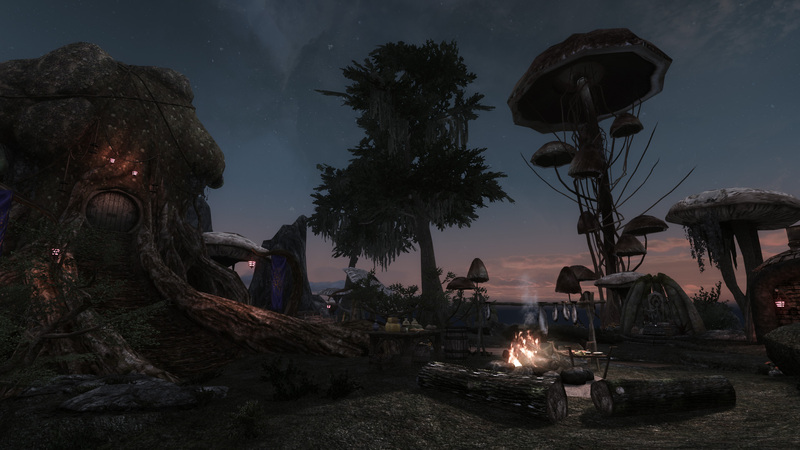 Changing to the performance version of some ENB Presets (where available) will essentially do the same thing; therefore, users are encouraged to explore that route before disabling effects. If after following these performance tips users are still unable to achieve playable frame rates, the system hardware may not be capable of running ENBSeries or the chosen preset might be too intensive to for it. At this point users may want to consider either using other presets which may not be as demanding on hardware, upgrading their hardware, or not using ENBSeries altogether. First be positive this is not a missing master issue! After you've ruled that out, some users will experience a CTD after installing an ENB Preset due to having missing components of DirectX. The solution is to re-install DirectX 9 for games such as Skyrim and Fallout: New Vegas. Windows users will have to update DirectX by downloading the DirectX End-User Runtimes. If that option doesn't work, try installing the DirectX SDK and running the installer within. Re-installing/updating DirectX should install missing components needed by ENBSeries. One of the great things about ENBSeries is that it usually fixes shadow striping. Some users, however, will still experience this issue if they've edited their Skyrim INIs. 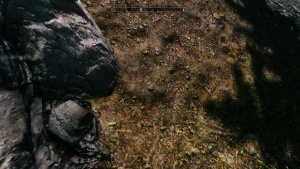 In the screenshots below it's hard to tell from their reduced size in the gallery, but notice the fuzziness along the edges of the shadows and the lines across some of the textures like the post and rock; this is shadow striping. If this is preset, adjust the iBlurDeferredShadowMask parameter in the SkyrimPrefs.ini file (MO users will have to adjust it in the INI Editor in MO). It will be set to its default from when the INI files where created by the game launcher, unless users have manually adjusted it. Turning this parameter down to a lower usually results in sharper shadow detail; however, turning it down too low can result in striping. Users can adjust this setting from 0-7. If striping occurs while ENBSeries is enabled, increase this parameter's value by one, save the change, and test the new setting in-game. Continue to repeat this process until the shadow striping is gone. Usually between 3 and 5 are the best values. If the above is not helping or making the shadows too blurry, adjusting the fShadowDistance parameter may also help. This is the distance at which shadows are drawn from the object. Decreasing this will make these shadows less elongated and help to eliminate striping at lower iBlurDeferredShadowMask values; however, adjusting this value too long can also result in unnatural looking shadows. Set the following in enbseries.ini. When updating drivers be sure to uninstall your current drivers before installing your new drivers. It is also not recommended to use Beta drivers. The current stable drivers can be found here. If you must use anisotropic filtering (AF), then either ENB-enabled or CCC-enabled is fine, but this depends entirely on the capability of your CPU since Skyrim is more CPU-intensive than GPU. ENB-enabled is better, but up to 8x is recommended unless you have at least 2GB of VRAM (generally the 69xx, 78xx, and 79xx series). Right-click on your desktop and open the Catalyst Control Center. Enter the 3D Applications Profiles. Go back to the top, select "New application" and press the "Save" button. Choose the "TESV.exe" application (in the root Skyrim folder) when the browser window pops up. Answer "Yes" when CCC asks if you want to override the default TESV profile. Open up the AMD Vision Engine Control Center (or the Catalyst Control Center). Make sure your are in Advanced View mode by clicking Preferences. Select "Gaming" and choose "3D Applications Profiles". Select "Add" and browse to and select "TESV.exe". "TESV.exe" should now show up on that page. Select it and scroll down to "CrossfireX Mode"
Overwrite the default profile when prompted. A common issue with Depth of Field effects is that it is difficult to see the character while in the creation menu. There is a very simple solution for this. While playing, just press [Shift+F12] to disable the ENBSeries processing entirely. This can be quite useful when creating characters or modifying them later via the showracemenu console command. When finished, just press [Shift+F12] again to re-enable processing. Some people may experience long loading times while using ENBSeries. An easy way to decrease your wait is by pressing [Shift+F12] before or just after entering the loading screen to disable ENBSeries processing. When the game is loaded press [Shift+F12] again to re-enable processing. If the above troubleshooting did not help, please refer to our ENB Support Forum for assistance. This page was last modified on October 26, 2017, at 18:36.